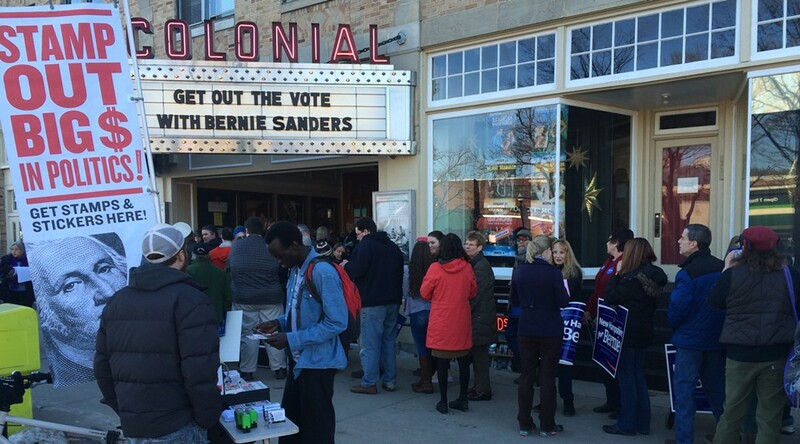 Lining up to see Sen. Bernie Sanders (I-Vt.) in Keene, N.H. This post was updated at 8:25 p.m. on February 2, 2016. Bernie Sanders on Tuesday kicked off a weeklong sprint to the New Hampshire primary by urging a crowd in Keene, N.H., to continue the work of his supporters in Iowa. Hoping to ride the momentum from his near tie with Hillary Clinton in Monday night’s Iowa caucuses, Sanders said the results showed that his goal of igniting a political revolution is possible. Sanders, who flew from Iowa to New Hampshire overnight, was noticeably hoarse during his 50-minute address before a raucous crowd of supporters. He took the stage only a few hours after Iowa officials certified the razor-thin caucus results. Clinton took 23 delegates from Iowa, while Sanders captured 21. In a press conference after his appearance in Keene, Sanders said he was not prepared to immediately concede the Iowa results until his campaign had a chance to examine potential irregularities in the vote tally. Reports indicated that some precincts broke ties between Sanders and Clinton with coin flips. "We want to to take a look at it," Sanders told reporters. "It may be that some delegates were determined by the flip of a coin. Not the best way to do democracy." Sanders' speech in Keene was laden with his familiar solutions for a “rigged economy.” Sanders said he would lower student loan debt, back a $15-an-hour minimum wage, and support mandatory family and medical leave. “It is about the workers in Vermont and New Hampshire who today are working two or three jobs trying to cobble together some income because real wages for millions of workers have gone down over the last 30 years,” Sanders said. Sanders made few references to Iowa during his speech in Keene, and never mentioned Clinton by name. But as he has frequently done in recent weeks, Sanders took a thinly veiled shot at Clinton's practice of giving paid speeches to Wall Street financial institutions and accepting campaign donations from big banks. “The story is, Wall Street has unlimited sums of money to spend in any way they want, including campaign contributions and speakers' fees," he said. Marcia Kayser said Sanders would do well in her native Keene, a college town 15 miles from the Vermont border, because of his passion. “We’re all on board. He’s genuine and enthusiastic,” Kayser said. Vermont’s proximity to Keene, Kayser said, would help Sanders “a little — but most of us didn’t know much about him. We knew his name and that he was liberal, but we’re not involved in Vermont politics." Polls taken before Iowa showed Sanders winning in New Hampshire. But in his press conference, Sanders cautioned that Clinton, who defeated Barack Obama in the 2008 New Hampshire primary after Obama won Iowa, was a skilled campaigner. “Secretary Clinton won here in 2008. Secretary Clinton has a very formidable political organization and the entire political establishment on her side,” Sanders said. "We are taking nothing for granted." Later, inside the Claremont Opera House, in the heart of a blue collar community that Clinton had won in the 2008 primary, the crowd shouted “Hallelujah!" and “We believe in you!” at Sanders.